Water is the elixir of life. It covers more the 75% of our planet. It nourishes every single cell in our body and makes up 65-80% of our being. It is a fundamental component of life: its availability and intrinsic qualities affected the development of civilization through the ages more than anything else. The quality of water can surely be tasted, but above all, it can be scientifically established. Numbers that leave a nice flavor. With a fixed residue of only 22 mg/l, a hardness of just 1.2 °F, a balanced pH of 6.6, and plenty of oxygen, Plose Water is one of the world’s lightest and purest waters. We compared Plose water with other waters on the market. We selected samples of 10 of the most common mineral waters and boiled them on a 180°C plate. On the side we display the result of the comparison highlighting the dry residues left over after the evaporation of each five-liter sample. Plose water is the first sample starting from the right. Compared to the other waters, it obviously contains less minerals not suitable for human body. 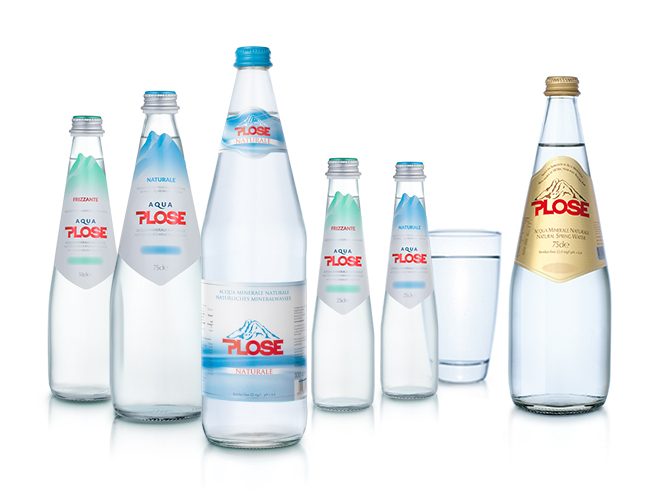 Plose mineral water contains the least unnecessary minerals. Besides having a fixed residue of only 22 mg/l, a very low hardness of 1.2 ° F, and a low sodium content of 1.2 mg/l, it is almost free of nitrates and completely free of nitrite. It is also naturally rich in oxygen, containing 10.2 mg/l. Plose water has a very high of oxygen content: 10.2 mg/l. This is one of the highest values found in commercial mineral waters. Oxygen is naturally formed in Plose water through a series of processes that enrich the water as it travels through the rocks of the mountains, before it springs pure from the spring. The oxygen present in the water we drink is absorbed through the stomach and enriches our blood with this vital element to our well-being. 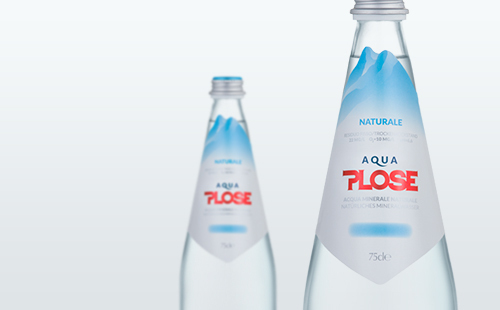 Plose water flows pure and unspoiled at an elevation of 1870m with a sodium content amongst the lowest available, only 1.2 mg/l. Thanks to its extremely low sodium content it facilitates diuresis, reduces water retention, and is particularly recommended for low-sodium diets. The pH of Plose water at 6.6 is identical to that of the human intracellular space: this value is ideal because it promotes the continuous exchange of cellular water. A slightly acidic pH in fact works against the alkalization of the cell and thus contributes to cellular aging. Pure water is formed from two atoms of hydrogen and one of oxygen, but the water that is found naturally on our planet also has many other substances. For example, the fresh water commonly found in wells, rivers, and lakes also contains bacteria, inorganic minerals, heavy metals, hydrocarbons and many other pollutants. When it comes to mineral waters, the lower is the value of the fixed residue, the lighter the water will be. Furthermore, to properly assess the “quality” of the water, other important parameters must also be considered. After years of studies and data collection far and wide, professor L.C. Vincent, an internationally renowned French hydrologist, found that the mortality rates from all disease is directly linked to the quality of water a population consumes. Mortality also increases when water is very mineralized and treated artificially by physical and chemical processes. He developed a technique called Bio-electronics, whose rules apply to all aqueous media. According to Vincent’s Bio-electronic analysis, the values of Plose water indicate excellent quality: Ro = 35,000 ohms, rH2 = 27, pH = 6.6 (energy value 4.89 uWatt). In fact the minor is the energy value uWatt, the major is the water quality.